Ohio PeriAnesthesia Nurses Association (OPANA) is a component member of and wants to provide these updates that will have additional information that can be seen on the ASPAN website: aspan.org but are highlighted here in for members to be aware of some opportunities and for personal inquiry as to news to benefit all PeriAnesthesia nurses. 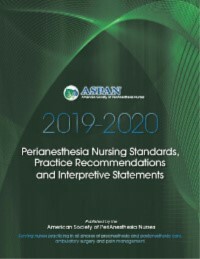 The 2019-2020 ASPAN Perianesthesia Standards, Practice Recommendations, and Interpretive Statements now available for purchase at aspan.org member price is $75.00 and non-members price $180.00 + shipping. which provide clarity and definition to key elements of the standards. perianesthesia nursing certification, and a position statement on marjiuana. Registered Nurse Caring for the Pediatric Patient in the Join as a member partner at Rate of $20.00!!! ASPAN's Webcasts and Seminars for Winter/Spring 2019 Now Open for Registration! • Learn from the comfort of home (webcasts) . .. The seminar brochure will be available and mailed to you shortly. Registration closes three days prior to all WEBCASTS. Registration closes one week prior to all SEMINARS. RESEARCH - Do you need help getting started or finishing your research study? OPANA supports nurses interested in doing Research Studies with Information for Members to access thru ASPAN website and using the Research Primer attached below for you to download. How to Access Info - Log onto ASPAN.org and go to the Research Tab located on the top and open to Research Information. Research information has several tabs that can be opened at the website including - RESEARCH INFORMATION: Applying to the IRB, Obtaining/Writing a Consent, Writing an Abstract, Writing a Research Proposal, Creating an Effective Research Poster, Publication Tips for Your Research, and the Research Primer for Perianesthesia Nurses • 2nd Edition • 2009. Topics in book include: Research Abstract, Research Proposal, Research Methodology, Discussion & Implications, Additional Considerations, Disseminating Findings, Participating in Research, Suggested Readings, and a Glossary.